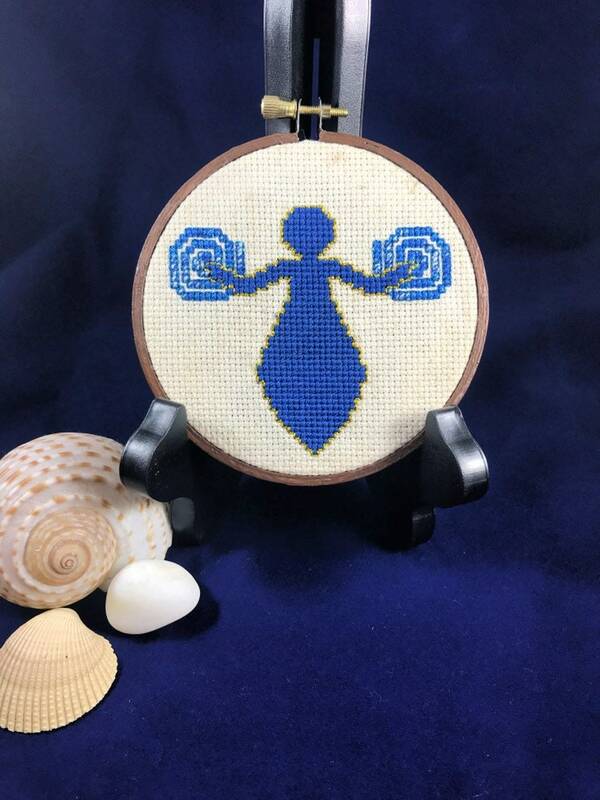 Minimalist inspired pagan artwork of a cross stitched Water Goddess or Spirit. The body is made with blue embroidery floss then outlined in metallic gold thread. Shown with arms outwards in front of grains on sandy colored fabric for a rustic or older feel. Spirals of water flow from her hands. The spirals are made with blue and white variegated embroidery floss and outlined in metallic blue thread. It is framed in a 4 inch hoop but measures a bit over. I painted the hoop with espresso brown acrylic paint and then sealed it. The excess fabric has been folded glued down and covered with felt to be softer on your wall. The Aida fabric is thick and rigid and therefore not easy to pull down. You may notice the folds on the back from this. This listing DOES NOT include the props. You will ONLY receive the embroidery hoop.